One of Wall Street’s veteran economic forecasters is toning down his economic growth forecast. 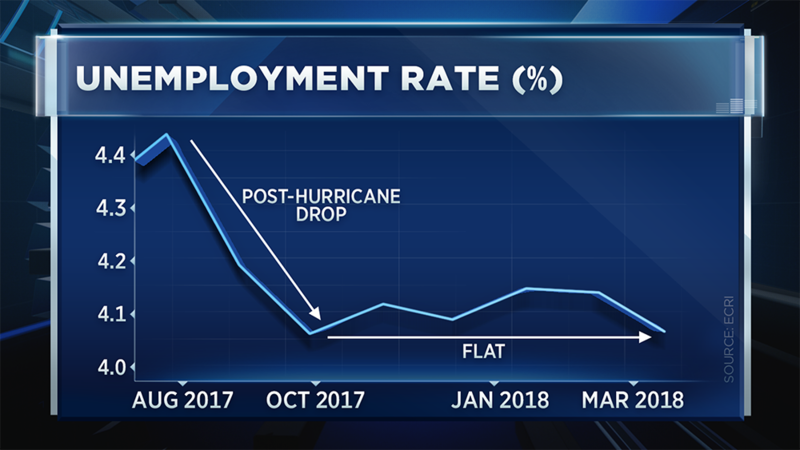 The Economic Cycle Research Institute’s Lakshman Achuthan told CNBC his leading indicators are pointing to a slowdown that’s picking up momentum — highlighting one particular trend in the latest unemployment rate chart that supports his case. He contended it doesn’t fit within the narrative of the United States’ strong growth story. Achuthan isn’t the only one. Guggenheim’s head of investing sees a tough road ahead for the market and economy, with a sharp recession and a 40 percent decline in stocks looming. Scott Minerd, who warned clients in a recent note that the market is on a “collision course with disaster,” told CNBC on Friday he expects the worst of the damage to start in late 2019 and into 2020. Along with the decline in equities, a rise in corporate bond defaults is likely as the Federal Reserve raises interest rates and companies struggle to pay off record debt levels. “When we look at what may be the backdrop for all the jitters that are going on, we would point to a good old fashioned slowdown in the economy that is coming onto people’s radar just around now,” Achuthan said. But don’t mistake Achuthan for being permanently bearish. He was a self-proclaimed “super bull” following the 2016 presidential election, as recession chatter was heating up. “Last fall, the same leading indicators that anticipated the synchronized global growth that we all enjoyed last year in 2017, they turned over,” he added. He isn’t calling for the economy to tank anytime soon. But with every passing month without a pickup in growth, Achuthan warns the economy will be less equipped to deal with a negative shock such as a potential trade war. So, he’s urging stock market investors to be vigilant.